Bairnsdale’s flying foxes are in the news again (see image) with the high temperatures the town has just experienced causing a dramatic increase in their deaths*. The Department of Environment, Land, Water and Planning (DELWP) have declared a ‘natural emergency’ because of the possible association of the bats with disease, and prohibited people from walking along the Mitchell River between the old port and the Lind Bridge. DELWP also reported the “large amount of heat stressed bats that are down low in trees”. 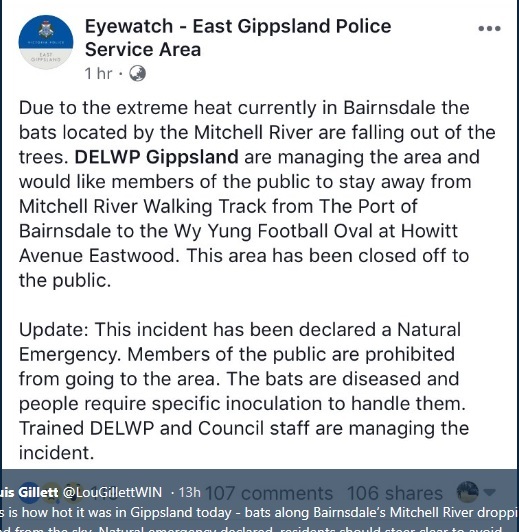 Ironically there is an emergency that extends well beyond Bairnsdale and Gippsland and is the direct cause of the bat deaths – extreme temperatures exacerbated by man-made global warming. Unlike the local ‘natural’ emergency which is a just possible (and minor) threat to humans the climate emergency is killing people now around the globe and directly threatens human existence. With reference to disease Sue Churchill in her Australian Bats (Reed New Holland 1998) stated “bats are very clean creatures that groom themselves meticulously; and healthy bats are very disease free”(p.25) although noting the connection between bats and lyssavirus had just been discovered as the book went to press. Churchill noted lyssavirus is a rabies related virus which she deals with in 3 pages and concludes “living near a flying fox colony…is no danger” but advises not to “handle live bats unless it is essential”. Less than 1% of the wild population carry lyssavirus** and this can only be transmitted by bite. Following Churchill’s advice means they are not a threat. The heatwaves and the fatalities of the flying fox are a wake-up call for Gippslanders. For if the bats are wiped out then we are next on the list. DELWP, along with our coal generators, carries a substantial amount of responsibility for the climate emergency, as do we all. The flying fox fatalities are just another reminder that urgent action on climate change is needed now. *literally “hundreds” Lisa Roberts. Another local account suggests “possibly two thousand”. Maximum official temperature 45.2C on 25.1.18. ***the interim Inter-governmental Panel on Climate Change report(2018) gives us until 2030 to ‘possibly’ avert major climate catastrophe. See here.